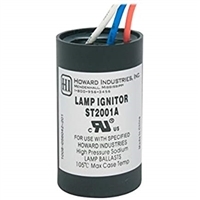 We offer replacement HPS ballasts in full kits or individual ignitors in a variety of wattage specifications. High-pressure sodium ballasts are a must for any facility that uses sodium vapor lamps, as they help regulate current and keep it constant with every use. All of our kits include all necessary parts and hardware for safe installation, but we recommend reviewing your lamp system’s specifications to make sure you’re purchasing the proper kit with the proper voltage. Contact us today at 217-806-0502 if you have questions, and remember that orders of $99 or more enjoy free shipping!